Porridge wasn’t limited to only oatmeal or cereal in liquid. Chinese congee, savory thick rice porridge had been so well-liked by Asians for centuries. I had fresh lettuce served with my congee. This was inspired by the congee meal I had in Hong Kong. I loved the idea of having fresh crunchy lettuce as it added different texture to this meaty congee meal, making a good balance. Good garnishing not just for decorating, it relishes the congee, too. Serve it nicely, and then, mix it all up before digging in, you’ll discover the pleasure of savouring such delicious and hearty Cantonese-style congee once in a while (smile). Cantonese congee often pairs with fried fritters (fried dough sticks – 油条) that savours marvelous experience of having a congee meal. I loved it so much! I cooked pork congee last evening as I felt like having some hot liquid meal as dinner. I always liked to cook with pig assortments (猪什) to offer more varieties in my congee. But to cook it simpler and quicker this time, I cooked with only the pork meat and added pig’s liver as an extra to the pork congee (猪肝肉粥). 1) Marinate pork meat slices and minced pork meat (separately) with seasoning, for 15 minutes. Keep refrigerated while marinating. Then, blanch pig’s liver slices with boiling water for 30 seconds, or till it’s half done. Drain and reserve for later. 2) To make congee: Rinse rice, place rice and water in a large pot. Bring pot to a boil over high heat. Add chicken stock (or cube), dried scallops and ginger, bring it to another boil before lowering heat to small fire, and simmer for 20 minutes. While simmering, you have to stir it continuously till rice breaks down and liquid slightly thicken. 3) Add pork meat ball and meat slices, and continue to stir. Add some water occasionally if porridge is getting too thick before it’s formed (thicken and smoothed). Add in minced meat (make into balls or have it mixed loosely in the pot). Then, add sesame oil, salt and pepper. Adjust amount of seasoning to your taste. Stir and simmer for another 10 minutes. 4) Add in blanched pig’s liver, 1 minute of heat off. Immediately after heat off, add raw eggs and few drops of light soy sauce into the pot and stir vigorously to mix eggs with congee well. Cover pot with lid for 1 minuted before serving. Laddle into bolw(s), garnish and serve hot with fried fritters. A bowl of my pork congee counts about 250kcal. With some fried fritters, counts added another 50- 80kcal. 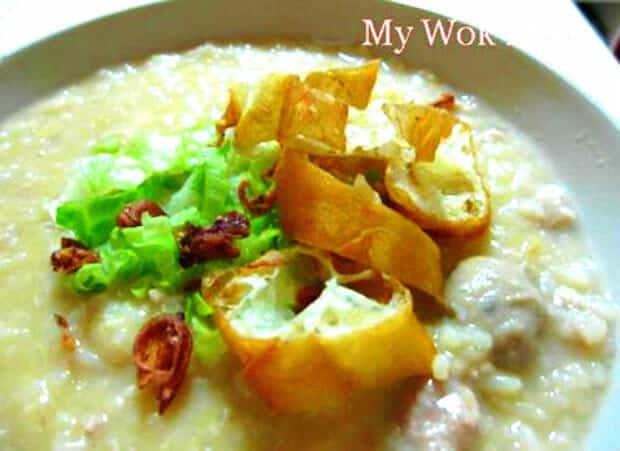 Tips: Right consistency of successful congee should be fairly smooth, light gluey with enough moisture. To achieve smooth consistency, rice has to be softened till completely emerged with the liquid by stirring it continuously (and mashing the softened rice grain to break it down with ladle occasionally) when simmering. Add water to lighten the texture, if you find some resistance to your stirring. * It’s ok if you don’t like pig’s liver. Opt it out. Hey, why do you put “1 teaspoon so-&-so..” and then x 2? Am I missing something here? I simply meant to prepare two portion of each seasoning ingredient. One portion to be used to marinate meat slices, and one more portion to be used to marinate the minced pork, so that both pork meat ingredients are well marinated. Hi, I would like to know roughly the size of the bowl for 250 calories. Could you provide me with the measurements of your bowl of porridge worthing 250kcal? Just regular bowl.. Slight bigger than rice bowl but smaller than those noodle bowls which we have noodles at outside stores. try to garnish with cilantro and fried peanut, taste superb! I agreed! Anything which is fried and crisped, will be good on the porridge.. In fact, I am going to use cilantro to cook fish fillet someday..
A typo error was found by a reader in this post. “Dried scallop to be steeped (or soaked) for 3 minutes.” It’s never meant “socked”. Apologise for the typo error. And, thank you, Karen, for informing me this. i tried cooking this earlier but the porridge smell really good but tasted rather tasteless, what could i do to flavour it up? Did you use chicken stock or chicken cubes? Enough salt in it? There are several ways to add flavour, add chicken cubes (or granules), if you did not. Add more salt. Or, after cooked and served in a bowl, drizzle light soy sauce and peper on the porridge. Add eggs into your porridge creates even better taste. You do not need to cook the eggs with extra time (unless you have problem eating non-fully cooked egg), simply add the eggs in once heat off, using the remaining heat to cook the eggs. Remember to stir it well to combine eggs with the porridge once added.